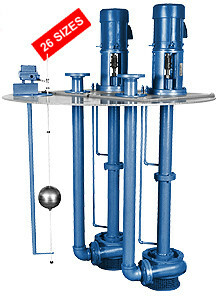 Vertiflo Pump Company’s vertical, horizontal and self-priming pumps are delivered fast, usually in half the typical lead time. 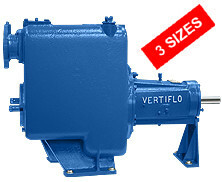 Since 1981, Vertiflo has concentrated on manufacturing vertical process pumps, sump pumps, end suction pumps and self-priming pumps in cast iron, stainless steel and special alloys. Vertiflo pumps are designed for nonresidential applications and currently over 20,000 are operating successfully worldwide. Vertiflo is recognized as a quality manufacturer of dependable pumps, and continues to grow and encompass new applications in the pump industry. The 600 series are industrial vertical centrifugal process pumps that are designed for a wide range of applications, including: spray washers, coolant systems and many more. 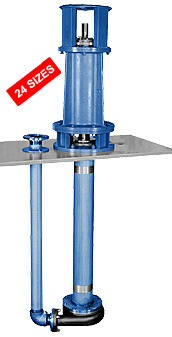 They are available in cast iron, stainless steel and alloy 20 materials. 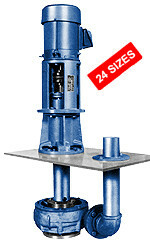 The 700 series are industrial vertical centrifugal sewage ejector pumps that are designed for a wide range of applications, including: industrial waste, sanitary waste and many more. They are available in cast iron materials. The 800 series are industrial vertical centrifugal immersion sump pumps that are designed for a wide range of applications, including: industrial process, corrosive liquids and many more. They are available in cast iron, stainless steel, alloy 20, hastelloy and CD4MCu. The 900 and 1100 series are industrial vertical centrifugal immersion vortex pumps that are designed for a wide range of applications, including” chemical slurries, pulpy solids and many more. They are available in cast iron, stainless steel, alloy 20, hastelloy and CD4MCu. The 1200 series are industrial vertical cantilever centrifugal pumps that are designed for a wide range of applications, including: industrial process, corrosive liquids and many more. They are available in cast iron, stainless steel, alloy 20, hastelloy and CD4MCu. The 1300 series are industrial horizontal, close-coupled, end suction pumps that are designed for a wide range of applications, including: general pumping, wash systems and many more. They are available in cast iron, stainless steel, alloy 20 and CD4MCu. Key features of this series is that they are back pull-out designed pumps with a semi-open impeller and packing or mechanical seal. The 1312 series are industrial horizontal, close-coupled, end suction pumps that are designed for a wide range of applications, including: general pumping, wash systems and many more. They are available in cast iron, bronze fitted, and stainless steel. 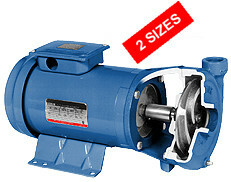 Key features of this series is that they are back pull-out designed pumps with a semi-open impeller and mechanical seal. 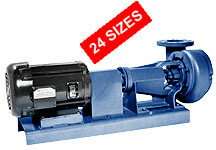 The 1400 series are industrial horizontal, based mounted, end suction pumps that are designed for a wide range of applications, including: general pumping, wash systems and many more. They are available in cast iron, stainless steel and CD4MCu. Key features of this series is that they are back pull-out designed pumps with a semi-open impeller and packing or mechanical seal. 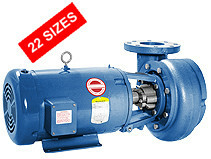 The 1400LF series are industrial horizontal, base mounted, end suction pumps that are designed for a wide range of applications, including: boiler feed, chemical process and many more. They are available in ductile iron, bronze fitted, and stainless steel. 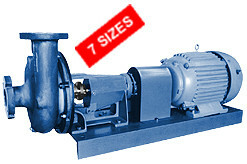 Key features of this series is that they are back pull-out designed pumps with radial vane impeller and packing or mechanical seal. The 1500 and 1600 series are industrial horizontal, base mounted or close-coupled, end suction vortex pumps that are designed for a wide range of applications, including: food processing solids, slurries and many more. They are available in cast iron, stainless steel, alloy 20 and CD4MCu. Key features of this series is that they are back pull-out designed pumps with fully recessed impeller and packing or mechanical seal. The 2100 series are industrial trash handling and solids handling self-priming centrifugal pumps that are designed for a wide range of applications, including: liquids entrained with solids, wastewater and many more. They are available in cast iron, stainless steel, and CD4MCu.